We often have this misconception that we’ll need to fork out a ton of money to make ourselves feel good, when in fact you can do it in your bathroom today itself! 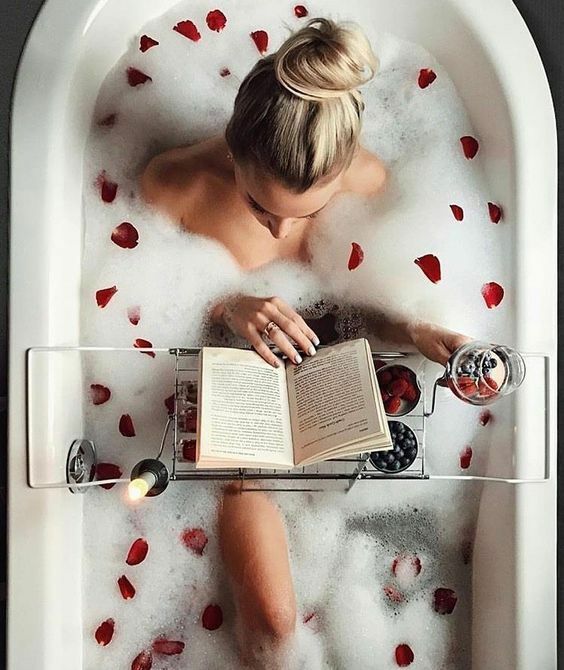 Believe it, nothing sounds better than turning your bathtub into your private spa and indulging in a luxurious hot bath. Most of us have the experience of muscle ache or soreness as the result of our daily stress. A hot bath is definitely the best way to call it a day! The temperature of the hot bath works like a heat pack that soothes tension and helps to relax your tight or inflamed muscles. Tip: Adding Epsom salt to your hot bubble bath gives you extra muscle relief! Using tools like a loofah or a pumice stone whilst enjoying your bath helps to remove dead skin cells easily. This is because soaking in lukewarm water moisturises your skin and that makes exfoliation simpler and more effortless. A hot bath can also help to open up the pores in order to get rid of clogged debris, leaving you with clean and healthy skin. Tip: Don’t forget to apply moisturiser or drink a cup of water after your bath as soaking in the tub might dehydrate your skin! A good night’s sleep is essential to start your next day right! If you are not a fan of having a cup of warm milk before you head to bed then taking a bath an hour or two before bedtime is your resort to enter an anxiety-free land of Nod. As our body temperature starts to drops at night, a hot dip rises the temperature hence the steep cool-down period after the bath improves your sleep quality! Enjoying a plunge after a long day is a therapeutic way to purify your daily grimes. Submerging yourself into the hot bath helps to reduce daily tension and also elevate your mood. Tip: Level up your bath game by adding a few drops of your favourite aromatherapy or essential oil into your bathtub! Alternately, you can also opt to light up scented candles or oil in the room instead of adding it into your tub. Soaking in a tub of hot bath helps to stabilize and induce your blood circulation. It also helps in preventing diseases like stroke or cardiac attack. However, it’s very important to make sure your bath is not overheated! Baths that are too-warm gives you heat stress! Therefore, people with heart disorders are advised to stay away from hot tubs. Enjoy your “me time” tonight!